Old Blues may wish to note that the job advertisement for a new Clerk for the Foundation (ie, the Counting House) was posted on the CH Website on Tuesday 23 January for response by Monday 29 January. To give old Blues just four working day's notice for what to us is a very important post seems a disgrace - or, perhaps, they just don't want Old Blues to apply but feel that they have got to go through the motions of posting a SitVac notice. It is true that the post was advertised in The Times in the third week in December, but why a full month's delay in putting it on the CH Website? Foureyes wrote: Old Blues may wish to note that the job advertisement for a new Clerk for the Foundation (ie, the Counting House) was posted on the CH Website on Tuesday 23 January for response by Monday 29 January. To give old Blues just four working day's notice for what to us is a very important post seems a disgrace - or, perhaps, they just don't want Old Blues to apply but feel that they have got to go through the motions of posting a SitVac notice. I would imagine that any OB who may be interested in applying would have known about it - it has been common knowledge for some time now that the position was becoming vacant. 1. Why did it take some FOUR weeks between posting the notice in The Times and its appearance on the CH Website - could they not have been posted simultaneously? 2. Why, when eventually posted on the CH website, does it allow potential applicants just six days (four actual working days) to send for the information pack, get their act together, assemble references, and submit their bid - even in the era of e-mails, this is asking a bit much. This particularly applies for potential applicants living abroad;it is not unknown, for example, for Australians to bid for posts at C.H. one specific Australian had the advantage of not currently residing in Australia though!!! As for your other points - I have no idea!! Mrs C. wrote: I would imagine that any OB who may be interested in applying would have known about it - it has been common knowledge for some time now that the position was becoming vacant. Sorry, Janet; I have to disagree with you there. b) I go into the CH website very rarely and it is fortuitous that "foureyes" was looking or the whole matter could have passed us all by. Please note that he seems to have seen it only on the Thursday allowing those interested just one day to apply***. Perhaps peeps can see why CH and I don't see eye-to-eye. b) IF it was mentioned here months ago that the post might become vacant then there was no mention that I am aware of either here or in the emails I get about the advertisement or the company employed to find a replacement or about the source of the specification/application procedures or of the timeline. I would have thought that logically the School would have wanted to address the widest possible number of potential applicants. It is therefore surprising if the advert was apparently restricted to The Times but I have to accept that this was their decision for whatever reason. I realise, Janet, that you have no part in the procedures prior to (nor after) application for the job so don't take this personally. Being in situ you see more of what is going on but please don't assume that everyone else has the same knowledge. IF CH had any interest in giving Old Blues an opportunity I am sure that they could have arranged for a reference to the advert to appear on the Forum either via the CHA or by a private request to the founder/moderators. I have to assume that either they didn't think of it or there was a conscious decision not to advise Old Blues or, worst of all, that the appointee was already agreed upon. *** If they become aware of all this then perhaps potential applicants will decide that this is one set of people they don't want to deal with. Why register to use an alumni forum if they are not prepared to identify themself to their peers/fellow former pupils (check out the profile as it currently stands). The points made might be legitimate but I wonder if there might just be another agenda running here. I certainly agree that it should have been publicised on the website and more widely than just The Times - perhaps someone should be asking questions in the right places as to why it wasn`? kerrensimmonds wrote: Who is 'foureyes'? Yes, I looked at his profile when I saw him join the forum. I thought perhaps he was another of these spam merchants. Then I saw that his occupation is listed as 'Loafer' so I guess he must work in a Bakery somewhere! I am an Old Blue and a pensioner ("loafer" was meant as a joke but has obviously mis-fired). I have no hidden agenda and, as far as I know, it is perfectly permissible for someone to particpiate on the Forum without giving their name - perhaps the organiser will correct me if I am wrong on this. I suggest that the discussion should concentrate on the questions I raised, which I believe are very serious ones, rather than trying to shoot the messenger. As far as I know, the fact that the CH Triumvirate (Treasurer, Headmaster and Clerk) would all be leaving their position over a short period, has been common knowledge for some time. I would have thought that anyone interested in any of these positions would have been "close" to CH so that they knew what was going on. 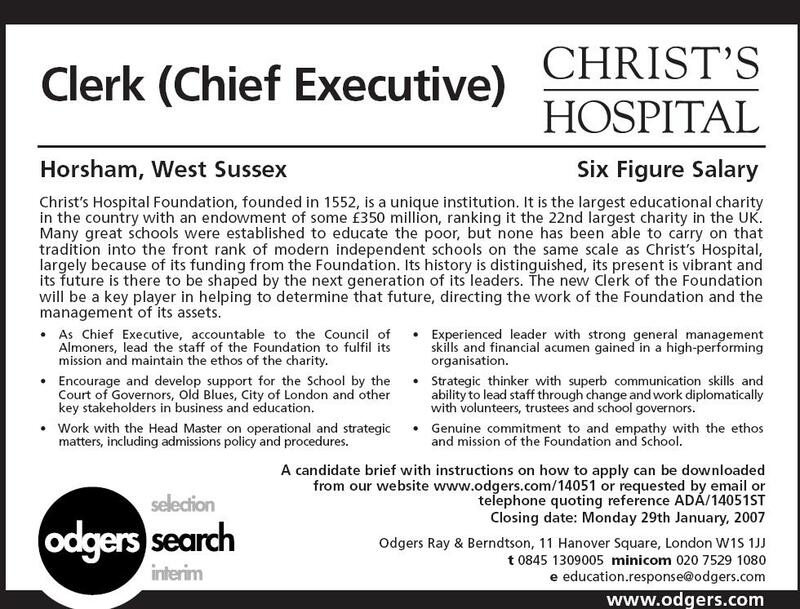 I knew about the position of the Clerk but was surprised that it was not advertised earlier. I assume the changing of the guard has some sort of priority. However, now that it is common knowledge, it is in the hands of Head hunters, who must have made their own recommendations as to when and where it should be advertised. I cannot believe there was a conspiracy to keep Old Blues out, probably more a matter of incompetence and the thought that interested Old Blues would already have their feelers out. What I find intriguing is that they are also looking for Major Donor and Trusts fundraiser. I believe this to be a new position and if it is, whilst it may be a valid requirement, it does smack of empire building. I assume they will also have a minor donor fundraiser. Fund raising is very important to CH but you would have thought that they would let the new Clerk get into position before changing his management structure. At the end of the day, whoever they get, I hope he is the best for the job. jhopgood wrote: What I find intriguing is that they are also looking for Major Donor and Trusts fundraiser. I believe this to be a new position and if it is, whilst it may be a valid requirement, it does smack of empire building. This position was advertised last year (October, I think). I believe that an appointment was made, but the successful candidate decided to take a job elsewhere. If so SHAME ON YOU!!! !